Kaitlyn Farrington, 22, has a shiny new green jacket because she's the queen of the 2012 U.S. Snowboarding Grand Prix series after Saturday's finals at Mammoth Mountain, Cal. After a week of cancellations and high winds, the 5-4, 115-pound Farrington took second place in the Sprint U.S. Snowboarding Grand Prix halfpipe. In the process she won her first Grand Prix overall title and with it, a $20,000 prize check. Farrington also won "Best Trick" for $10,000 with a backside 900 and was crowned the Halfpipe National Champion. For the weekend, she pocketed $36,000 and then took a run. Recovering from wrist surgery three weeks ago, Farrington literally ran from the podium to catch her flight to the Burton Vermont U.S. Open. Another Sun Valley Ski Education Foundation rider, 16-year-old Chase Josey, had trouble on both runs at the Grand Prix but was throwing a run that could land him in the mix at next years events, according to SVSEF Head Shred Andy Gilbert. Josey was named to the U.S. Snowboard Junior Worlds Halfpipe Team and will compete March 23-27 at Sierra Nevada, Spain. Gilbert was named to the U.S. coaching staff for this junior worlds event and will travel to Spain with Chase. It was a big week for Sun Valley snowboarding as riders were named champions, named to represent their country in Europe, as well as assert themselves regionally. SVSEF coaches Jacob Tyler and Ed Sawicz took Comp and Prep riders to Park City for the USASA "King of the Wasatch" finale of the Intermountain Snowboard Series. For many of the young riders this marked the longest trip away from home and so insight of things to come in the future. For the older kids this would show them if they could punch their ticket to USASA Nationals at Copper Mt., Co. in April. Open Men's Ryan Roemer was overall King of the Wasatch and won $350 for a prize. 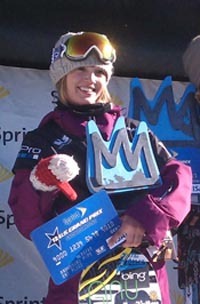 Top slopestyle class finishes: 1—Clara Jenner. 2—Payton Bacca (10-11 girls). 1—Elk Spencer (10-11 boys). 2—Cora Schneider (12-13 girls). 26—Clyde Montgomery (12-13 boys). 3—Rex Kelly (16-17 men). 1—Josie Bunce (Open Women). 3—Ryan Roemer (Open Men). Top halfpipe class finishes: 1—Clara Jenner, Elk Spencer, Dash Stethem (18-19 men), Rex Kelly, Josie Bunce and Ryan Roemer. 2—Payton Bacca, Rex Kelly and Ali Appleton (Open Women). 3—Cora Schneider. 5—Clyde Montgomery.